I found a place to bunk when enjoying a foodie dinner in Southeast Portland and I don’t want to venture back home. The Bluebird Guesthouse at 3517 SE Division St. is just a block away from Ava Gene’s and Andy Ricker’s Sen Yai noodle emporium. You are only blocks away (or a bus stop or two) from Block + Tackle/Roe, Woodsman Tavern, and Pok Pok. The #4 bus is one with “frequent service” to get you to downtown Portland, MAX, and anywhere else you don’t want to go on foot or by bicycle. You can check available rooms on their web site, and they give a discount for same-day bookings by phone. They have a sister guesthouse a few blocks away, Evermore, for more options. The Bluebird is a typical Northwest Craftsman-style home, with rooms converted into guest rooms. With your reservation you get a code to enter the front door and you can enjoy the common areas if your room isn’t ready yet. The common areas include a living room, dining room, parlor, kitchen, and sun room with an internet-access computer. The seven guest rooms are each of a different style and configuration and named after local authors. I got the Elliot Smith room, one of two in the finished basement. There is no bathroom on that level, so you must use the shared toilet on the main floor and the shared toilet, shower and tub on the upstairs floor. The room had a comfortable queen-size bed, four excellent pillows, good linens, an open closet, desk, towels and bathrobes provided. I was very pleased that there was no odor, either perfume or mildew. The room was situated under the common living room, and you could hear people enter and leave. The stairs up to the kitchen also creak quite a bit. I found it cozy enough, with the heater doing a great job in the very cold weather. Two rooms have their own private bathrooms. The upper floor rooms would have the most convenient access to the shower, tub and toilet. Reading material and games were available in the common rooms. 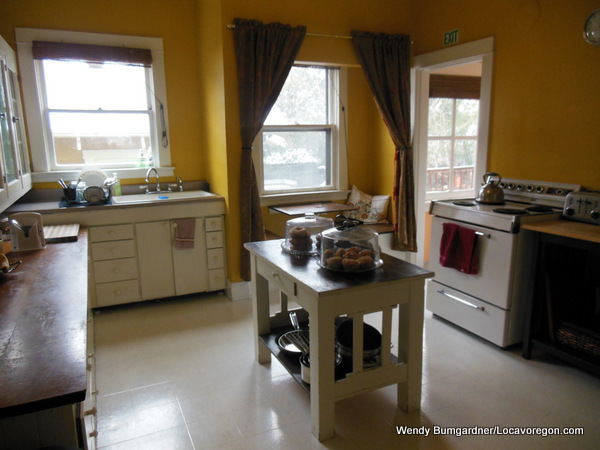 The kitchen was excellent, with fruit, muffins, juice, bagels and cream cheese available. Guests can store food in the common refrigerator. The coffee was all set up and ready to go, and tea was available. I enjoyed the convenience of the food and drink. There was no waiting, all self-serve. I very much enjoyed the convenient location, great price, easy check-in and check-out. If you want more of a social B&B experience, this may lack that vibe. But if you want a place to bunk in a classic Northwest house while enjoying Portlandia, the Bluebird Guesthouse is a great choice.